Alcatel-Lucent makes a bold but messy takeover target for Nokia. A potential all-share deal would create a telecoms equipment giant worth roughly 40 billion euros. Nokia investors seem sceptical. That is understandable: a deal would spark another of the industry’s seemingly endless series of restructurings, while the French connection adds complexity. Swallowing Alcatel would underline Nokia’s transformation from handset giant to network equipment heavyweight. The main draw is Alcatel’s wireless unit, which would take its share in this market from 20 percent to 30 percent. Nokia would become a stronger second player behind Ericsson and win a huge leg-up with major U.S. telecoms operators such as AT&T and Verizon. If you want to make money selling wireless kit, scale helps a lot. Overnight, Nokia would add heft in three other segments – fixed-line access, internet protocol routing, and optics. Liberum analysts reckon this breadth could prove useful as mobile and fixed-network technology converges. But for now the lack of overlap means Nokia has neither synergy potential nor expertise. That is why analysts had seen a purchase of just the wireless unit as simpler and more likely. By early afternoon on April 14, Alcatel’s stock was up 14 percent, reflecting the likely premium in an all-stock deal. Nokia’s stock, which fell sharply in earlier trading, recovered somewhat to stand about 3.7 percent lower. Those shifts add roughly 1.5 billion euros to Alcatel’s market value and take 1 billion euros off Nokia’s. That still looks harsh on Nokia, when Bernstein analysts reckon the synergies in wireless alone could be worth 1 billion euros a year. However, even with seasoned turnaround specialists in charge, harvesting the benefits of a new combination will take years. Both companies are themselves products of messy mergers and protracted restructuring. History might repeat itself. Moreover, Alcatel remains a work in progress. It has made great strides in cost-cuts, divestments, and refinancing. But free cashflow was still a negative 420 million euros last year. What’s more, any deal will also need to assuage Paris’ jitteriness about threats to French jobs and industrial prowess. Connecting all the dots won’t be easy. 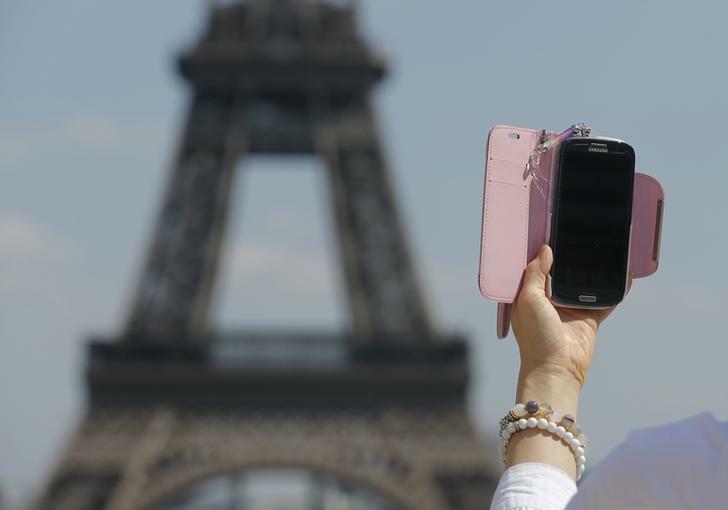 A woman uses her mobile phone to take a selfie picture at the Trocadero Square near the Eiffel Tower in Paris, May 16, 2014. Nokia and Alcatel-Lucent are in advanced talks about combining to create a telecoms equipment giant with a merged market value of nearly 40 billion euros. In a joint statement on April 14, the duo said the potential deal would be a “public exchange by Nokia” for its French counterpart. The confirmation followed media reports that Nokia was in talks to buy Alcatel’s wireless unit, and was exploring a sale of its own mapping division, HERE. Shares in Alcatel leapt, standing 10.7 percent higher at 4.27 euros by 0855 GMT on April 14. In Finland, Nokia’s stock slid 7 percent to 7.22 euros.